I love Tapas. There’s just something about Tapas’ sharing plates scattered around the table which creates a convivial atmosphere and lends itself so well to informal dining, something I’m always looking for in a good restaurant. Stuff the pretence, eating out should be fun and stress-free. Tapas also takes the pressure out of ordering as with no danger of choosing a duff main course it allows you to take a few risks - even if there’s a dish you aren’t keen on there’s always plenty more to get stuck in to, and usually a dining partner who likes the ones you don’t. Of course the way we eat Tapas in this country isn’t really how they do it in Spain, where the food is an accompaniment to a few drinks, as I talked about briefly in my previous article "Yorkshire Tapas: Where to find the best bar snacks in Leeds". The British public en masse have a slightly distorted view of Tapas that it’s simply a style of restaurant, where you share the dishes but is ultimately still a sit down meal, i.e. not everyone has come around to the idea of bar Tapas in its truest form. I mention this divide between how many people view Tapas in the UK, and how it's done in Spain, as after visiting El Bareto in Chapel Allerton last night (a £6 taxi ride from Leeds City Centre) I’ve seen that it is possible to have it both ways. 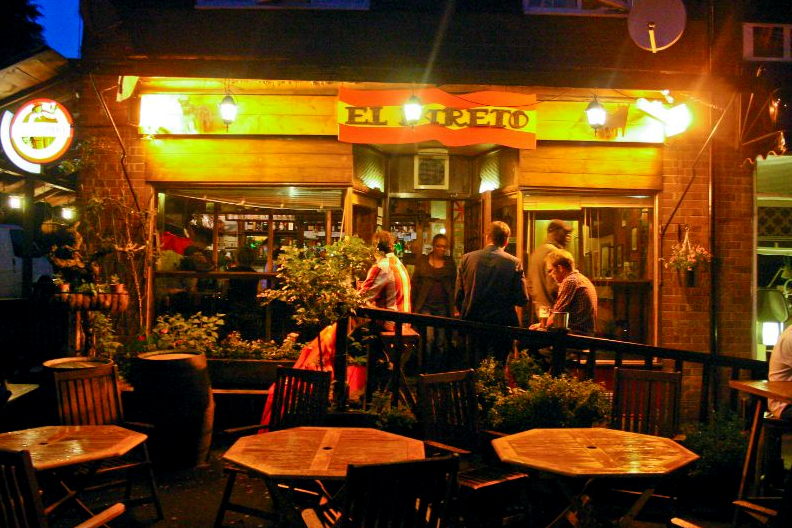 Set up by two Spanish brothers, one of whom is the chef, El Bareto have got the balance just right with a bar area bustling with locals (both Spanish and British) and a separate dining area for those who want to sit down to a meal. It’s a great way to do things that seemed to keep everyone happy – some there for a few drinks and maybe something to nibble if they fancied it, others sitting with friends around a large table for a communal Tapas meal - The best of both Worlds, and a truly Anglo-Spanish approach. As you may be able to tell, even before I got to the food I liked the feel of this place. It’s the same feeling I get when I visit the excellent French restaurant La Grillade - that sense of stepping out of Leeds and into another place. The friendly, relaxed reception of the Spanish waiting staff and buzz of the customers at El Bareto transports you to España in the same way as the surly yet efficient manner of the La Grillade staff, and the waft of garlic, transports you to a French Bistro. I was slightly sad to see that despite the glowing Cruzcampo sign outside there wasn’t any on tap, in its place being some solid Spanish lagers including Estrella, Mahou, and San Miguel, as well as some interesting bottled beers including Alhambre Reserve (6.4%) from Granada, Mezquita (7.2%) from Cordoba, and Guinness FES 7.5% from Ireland. I ordered a bottle of Alhambre Reserve while we looked over the menu and specials board. It’s a beer that’s a cut above your average Spanish lager - very fresh tasting with a nice underlying grainy malt character and a dry, herbal hop finish, very nice. There was plenty on the menu that tickled my fancy but in the end we went for some marinated olives to nibble on followed by Stuffed Squid (from the specials board), Grilled King Prawns, Oven Baked Spanish Black Pudding, Duck with Caramelised Onions and Goats Cheese, and Canary Island Potatoes with Mojo Picon. We’d been informed by the really helpful waiter that the dish portions were quite large for Tapas, and that he’d recommend five dishes between two people, but that we could always order more if we were still hungry. I’ve always thought 3-4 dishes per person to be about right in most Tapas restaurants in the UK, but I’m glad we took his advice as when the dishes arrived they were, as promised, very generously proportioned and five dishes was more than enough food for the hungry two of us. The potatoes, prawns and stuffed squid arrived first with a welcome short break before the black pudding and duck were brought over. The five huge king prawns were fantastic, with that hot shell flavour you only seem to get from grilled shellfish and moist, succulent, massively flavoursome flesh. All they needed was a little squeeze of the lemon wedge and a dunk in the silky mayonnaise. Perfection. The canarian potatoes came with two really good, freshly made sauces - one with I think red chilli, tomato and pepper mashed to a pulp and the other with a combination of parsley, garlic, butter and maybe coriander. The potatoes themselves were good but not really ‘canarian’ potatoes as I’ve eaten them on the canary islands, i.e. totally encrusted in salt with a slightly roasted flavour (they boil the potatoes in seawater until dry). Still nice though and I’m perhaps being a bit picky as everything else was so great. The squid was also really good if a little bulky. It was a massive portion of whole squid stuffed with a really tasty and well seasoned mixture of prawn, salmon, onion, garlic and more squid including my favourite bit, the tentacles. Split between two people it was excellent but I’d probably not order a whole one for myself. The Duck sounds like a strange dish on paper – Duck breast, caramelised onions and goats cheese – but was actually a fantastic combination. Rich Duck, sweet onions, tangy goats cheese coming together to make something greater than the sum of its parts. It would have made a great main course salad, or even a slightly adventurous Pizza topping. The black pudding was, as I’d hoped, the traditional Spanish version called ‘Morcilla', where the black pudding contains rice and slightly different spices to the English variety. It had been baked in the oven on a bed of onions and was beautifully flavoursome and rich, with a kind of black pudding risotto flavour to it thanks to the soft rice. Fairly similar to English black pudding in flavour but the rice made it much more substantial. Again, really good, and something I’d been wanting to try after seeing Rick Stein talk about it on his most recent (and excellent) TV Show ‘Rick Stein on Spain’. On the drinks front the flavoursome yet refreshing Alhambre Lager was a perfect partner to seafood dishes such as the stuffed squid and prawns we had, but the excellent, very lightly oaked Hacienda de Haro Rioja we ordered later was a much happier bed fellow with the stronger, richer flavours of the black pudding and Duck. It was also an absolute bargain at £15 a bottle. We took the waiters advice and opted to share a whiskey cheesecake for dessert. Of the set rather than baked variety it was thick and rich but not too sweet and with a really nice boozy whiskey flavour running right through it. I'm not a big dessert fan and Colette doesn't like whiskey, but we both loved this, which goes to show how good it was. El Bareto is the real deal, and as one of the owners told me at the end of our meal “It doesn’t matter that we are in Leeds, this restaurant would be exactly the same if we were in Spain, I wouldn’t change a thing”. Those prawns look excellent, as does the morcilla. Could just munch a plate of that right now. Glad to hear it's good. It was all lovely but the prawns were the highlight for me. My photos don't really do the food justice either but I refuse to put the flash on in a busy restaurant! I'd like to go again and just have a few beers and a nibble. Sounds very good mate. You're certainly right about the misinterpretation of tapas being a sit down meal. There's something quite nice about the transient nature of sitting at a bar with a fine beer and a quick (but blooming lovely) bite. A bit like the Milanese do with aperitivos. Alhambra also a good lager. I must admit I'm a sucker for their no label bottle....just subtle embossing.